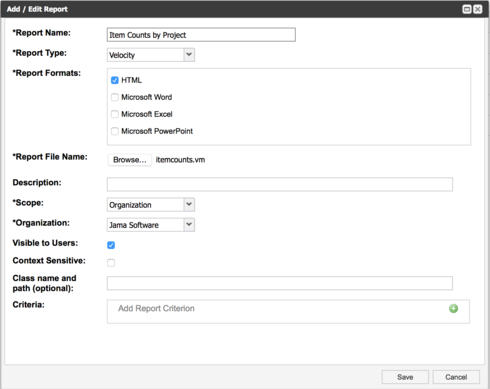 Note that user-created Velocity reports can be uploaded to on-premises versions of Jama only. Hosted customers need to follow the instructions here to have their reports uploaded. This is a guide to writing Velocity reports in Jama. It demonstrates starting with a basic template and building the report through multiple iterations, making small changes at each step so that it is easy to see what worked and what did not. This shows a specific report as an example, but the workflow should apply to any report you want to write. 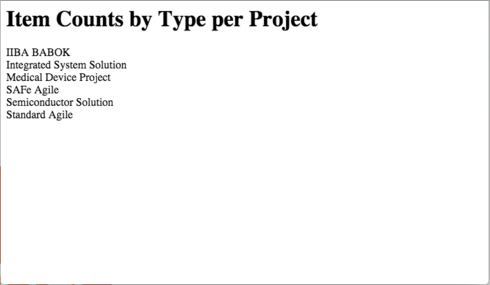 To run the report, select a project and then Reports > Item Counts by Project > Run Report. Velocity reports are fundamentally just HTML markup, so start with a very basic layout. 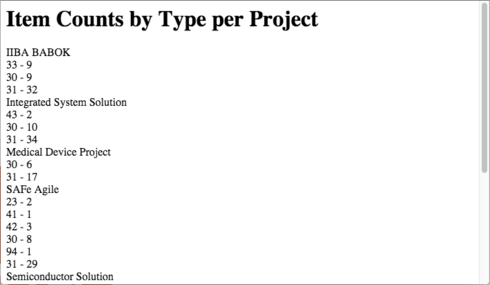 First, the report needs to list available projects in Jama. 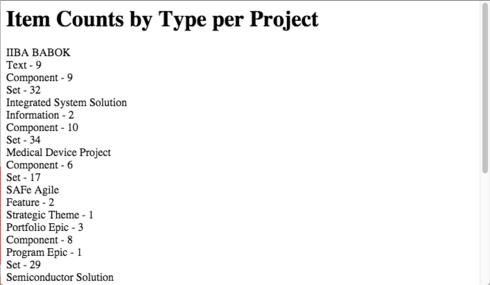 In Jama's Velocity report documentation, the projectDao.getProjects() method returns a list of projects. What is "Dao"? What is "Bean" and why do I need to get one? Velocity (and Jama) are written in the Java programming language. Think of a Data Access Object (DAO) as a helper that retrieves records stored in a database. Different DAOs would be used for different kinds of objects. For example, projectDao is used for projects, relationshipDao is used for relationships, and so on. A JavaBean is a Java class that follows certain conventions for naming and behavior. $projectDao = $applicationContext.getBean("projectDao") basically says "get me a projectDao object and store it in the variable $projectDao." 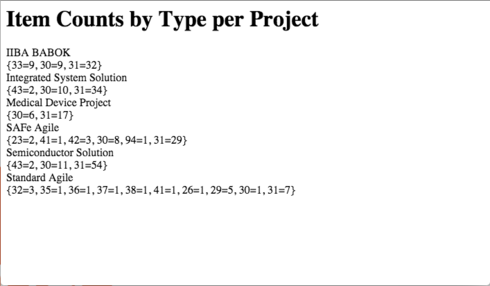 The variable name and bean type do not have to be the same, but it makes things less confusing! Some entries are showing up in the list twice, like "IIBA BABOK." 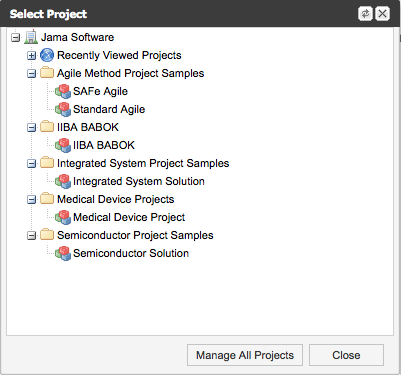 In the Select Project window in Jama, projects can be arranged in Folders. The folders are the extra entries in the previous example. 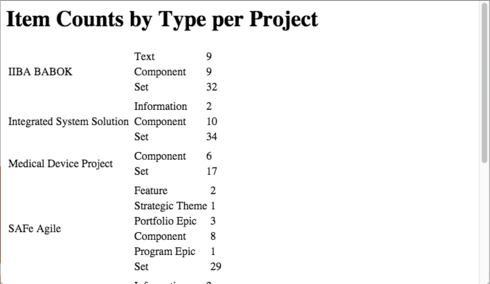 For this report, the folders are not needed, just a list of projects. To fix that, check to see if each project is a Folder, and only show it if it is not. In Jama's Velocity documentation, contourIteamDao.getAllItemTypesCount() returns a map object, which is a list of name/value pairs. 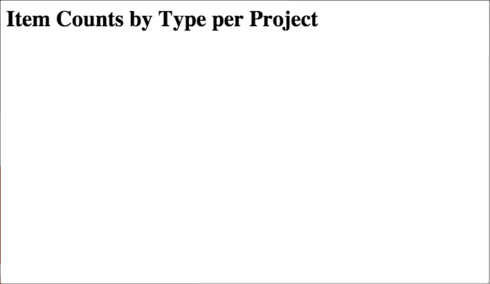 In this case, the name is the Item Type and the value is the number of items of that type in a project. Each Item Type should be on its own line. The Velocity User Guide has an example of how to get keys (names) and values out of a map object. That is a good start, but the report needs the name of the Item Type instead of just the ID number. In Jama's documentation, documentTypeDao.getAllDocumentTypesMap() returns a map object containing id/document type pairs in a given organization. For each Item Type, get the name of the Item Type from the $documentTypes map, and the count from the $itemCounts map. Note: Another way to do this would be to make a documentTypeDao.getDocumentType() call for each document type in the report. In a short report, this probably would not make much difference. 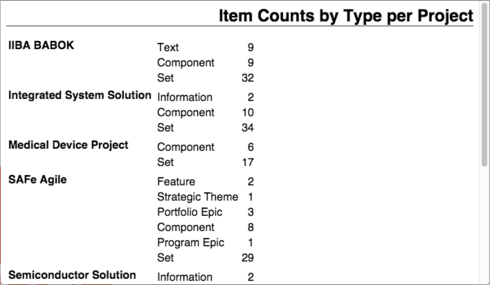 In a report with many projects and Item Types, it could be considerably faster to get all the document types at once. 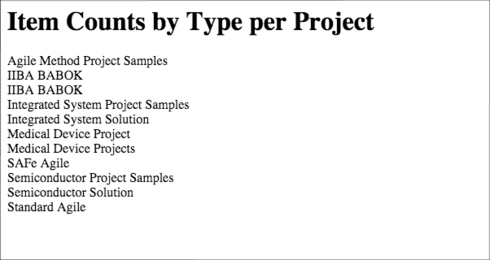 Now that all the data is in the report, change the page layout so each project is in its own row with the Item Types to the right. Finally, change the font on the page, add formatting and fix the alignment in the tables. If a variable or property does not exist, by default Velocity will print the variable's name instead. Often that is because a property does not exist on one type of item. For example, when iterating through all items in a project, a Requirement and a Test Case have different fields. Problem: When the report is run, the report just says "No results"
2015-12-22 06:48:01,008 ERROR Thread-1110 [ware.contour.util.ReportRender] - Can't render. The bean name is case sensitive - it should be "projectDao" instead of "projectDAO." This is my new favorite post!!!!! THANK YOU!